Six-Figure Settlement Reached for 65-year-old Peruvian native for Slip and Fall Injury on Icy Sidewalk. Y.T., a Spanish-speaking 65-year-old native of Peru, was walking home from a beauty salon on a cold winter day when she slipped and fell on an icy sidewalk. Y.T. landed on her left side and immediately started to feel numbness, pressure, and very severe pain in her left arm. During her visit to the hospital, it was determined that Y.T. had sustained a fracture and would be needing surgery in her left wrist with inserted hardware. Posted in Our Clients Speak | Comments Off on Six-Figure Settlement Reached for 65-year-old Peruvian native for Slip and Fall Injury on Icy Sidewalk. N.K., a 62 year old Russian-speaking woman, tripped and fell on a raised sidewalk flagstone in the Coney Island community of homes known as “Seagate”. N.K suffered two fractures, one of the wrist and the other of the collarbone. Although N.K. lacked health insurance, she was still able to treat for the injuries she sustained from tripping and falling. Miss L was enjoying her day at a local shopping mall when she broke her wrist at a department store. This senior citizen underwent repair surgery and the medical bills began to pile up. 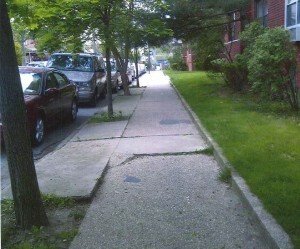 A poorly maintained sidewalk caused her to fall, and Hill & Moin LLP helped her recover. C.S., a retired schoolteacher from Brooklyn, NY, 62, fell a few years ago on her way to a hair salon. She tripped over a deep crack in the sidewalk and broke her left wrist. She learned quickly that she couldn’t trust just anyone to protect her rights. She went into the salon and told the owner what happened, and he said gruffly, “What do you want me to do?” The attorneys at Hill & Moin LLP had a different response.